A couple weeks ago I showed you all my new console table and I mentioned that I was inspired to start working on the living room again. I decided to start with the wall behind my new console table. I love the DIYabstract art that I painted, but it’s just not large enough for the space…especially with the new, longer table. So I decided to build a large gallery wall to showcase all of my travel photos. Unlike my previous gallery wall, I decided to buy new, matching frames for this project. I liked the idea of using a few different colors/styles, but wanted them to look a little more cohesive. 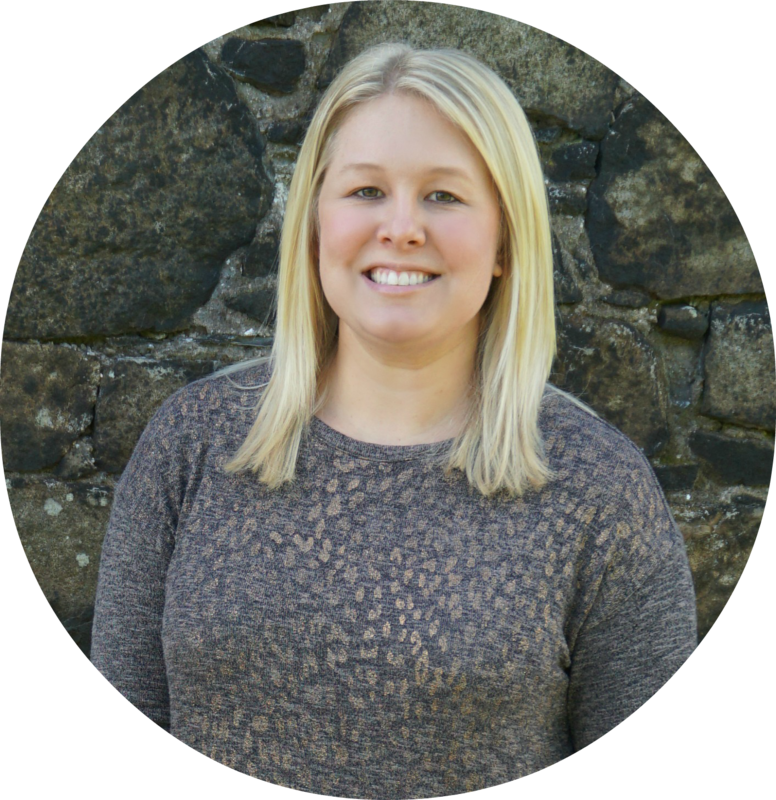 I also wanted to use larger frames this time because smaller frames can look too cluttered. Anyway, as you know, frames are expensive and I didn’t want to drop hundreds of dollars on this project. Well, I lucked out and I ended up finding almost all of these frames on clearance at Michael’s! I wasn’t a fan of the bronze and gold colors, but the small frames were only $6 and the larger frames were only $8. So, I decided to buy them and just spray paint them. The bluish-gray frames were a combination of clearance and sales. I ended up paying $12 for the largest frame and $10 for the others. I also had to buy mats for 4 of the bluish-gray frames, but the rest of them came with mats. Now that I had the frames, I had to decide how I wanted to arrange them. I used painter’s tape to mark off how large I wanted the gallery wall to be. It’s a great way to visualize what’ll work on the wall without actually hammering any nails. After I decided on the size, I pulled the tape off and laid it on the floor. It took up almost the entire office floor space. I used that area to arrange the frames into a layout that I liked. It took FOR-EV-ER plus a few trips back to Michael’s to buy more frames before it was full/completely arranged. As you'll see later, I ended up making a couple more changes once I started hanging the frames. I started picking photos for the frames while they were still laid out on the floor, but I kept changing my mind, so I figured I might as well get them hung and worry about it then. Plus I wanted my office back. I could hardly walk in there! So I hung two of the pieces of tape back on the wall and used that corner to hang my first frame. From there I just hung the frames going up and over until all of the frames were hung. After that I started picking pictures for the frames and spray painting the bronze and gold frames. I decided to paint the bronze frames black and the gold frames white. I love how they turned out and I love how the three colors look together. They tie the main colors of the room together. I think picking pictures for the frames was the hardest part of this project. A majority of them are from our trip to England and Paris last year, but I also included pictures from Alaska, New Orleans, Hawaii, Japan, Maine, Colorado, Catalina Island and my most recent trip to England. I love how it turned out and I love being able to see pictures from our vacations every day. Anyway, I ended up spending about $150 on the frames and mats, which isn’t chump change, but is a killer dealer compared to how much I would have spent on 18 regular price or even 40%-off sale frames. I had all of the pictures printed at Wal-Mart for about $45. Plus the cost of spray paint, this project ended up costing about $200. Not my cheapest project, but I love how it turned out and I’m so happy to have that large wall finally filled. Now I just need to decorate the console table and I’ll finally be done with that wall! I LOVE how this turned out!!! 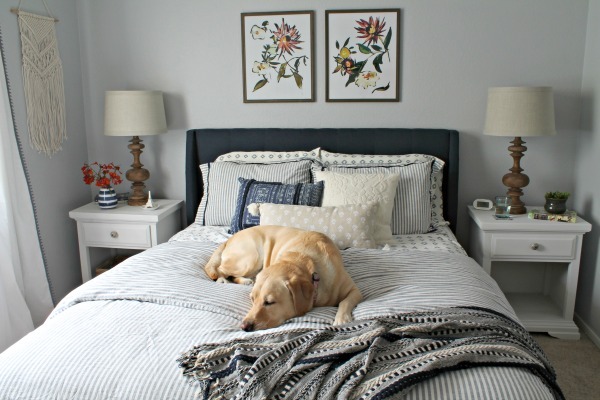 The size of the gallery wall is perfect and the colors work great together. 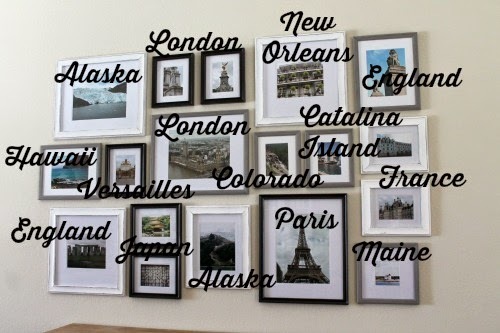 It's so cool that you have so many travel pictures to hang. Looks amazing! I love this Sam! Its amazing! Fantastic Sam!!!! 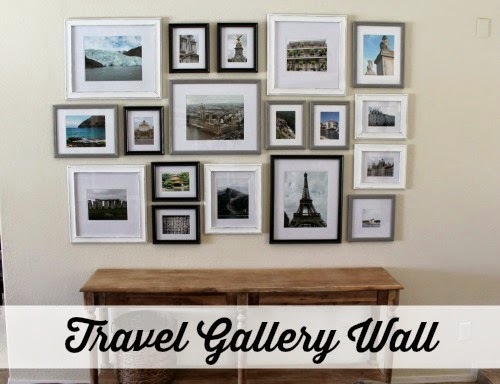 I love remembering my travels, but your gallery wall is making me so jealous! Great idea Sam! It turned out really good! Ha! I have a stash of a lot of those same clearance frames! I love this idea of a travel gallery. How smart, and what a good memory from all of your trips! Thanks for sharing with us at Best of the Nest!